These commonly forgotten budget categories can make you go over budget month after month. Fix your budget once & for all by including these forgotten budget items. I’m not alone. You’re not alone. Budgeting is hard especially when your budget is missing categories. 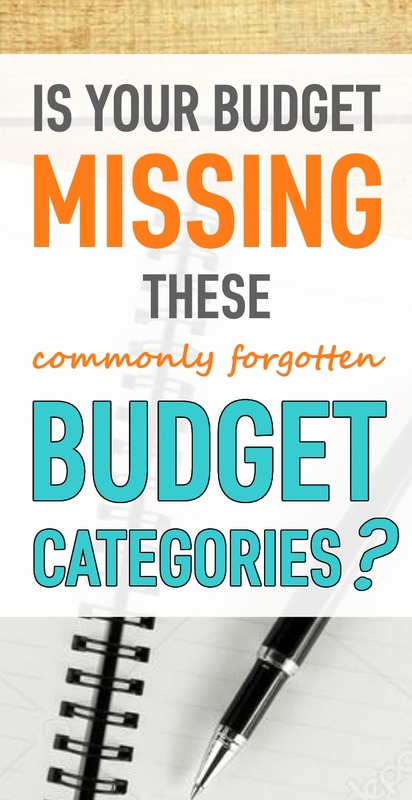 Below is a list of the most commonly forgotten budget categories. Run through the list and identify any expenses that are currently missing from your budget. Then, (of course), add them to your budget so you will always be prepared for any expense that comes your way! Each year, my husband’s work holds a formal event. It’s the fancy party where you are supposed to wear floor length gowns. Those things are expensive! And then there is wedding season – dress after dress after dress (although now I’ve stopped buying new dresses and simply cycle through my wardrobe). You probably have holiday and birthday gifts in your budget, but don’t forget there are other event, like weddings and baby showers, that you have to buy gifts for too! Do you have a cool fun hobby? Do you know how much it costs you each year? Whether you are a scrapbooker, a budding woodworker, or a green thumb gardener, the cost of hobbies can add up. There’s always a new tool you have to buy for a new project you want to try. Make sure you include your hobby costs in your budget. I love office supplies. I was that kid who would get excited for the first day of school because it meant fresh Lisa Frank folders, glittery pens, brand new erasers, binders with rings that fell right into place, …. and I could on and on. But now I realize that office supplies are expensive. I just spent $75 on printer ink. So not cool! And then there’s the paper, the pens that I’m kind of picky about, the endless supply of post-it notes. This stuff adds up! I was shocked when I went to college and my roommate didn’t know what a toll was. While some parts of the country don’t have to pay to drive on their roads and cross bridges, some of us do…and it can add up. It’s $12.50 to cross the George Washington Bridge! I have no words. Speeding tickets are the worst. I have cried over each one I got because they simply destroy the month’s budget. If you are prone to getting speeding tickets (I used to live in a place with speeding cameras on every corner), then you may want to put aside some money in case you get a ticket. There are some other fines that hopefully you don’t get too often – library late fees, credit card payment late fees, or free trials you forgot to cancel (yep, I’m calling that a fine on your forgetfulness). Besides your annual checkup, you or a family member might get sick and require extra doctor visit(s). But hopefully not. However, better safe than sorry and make sure you budget for doctor appointments. Can you even leave these stores without spending at least $100? These wholesale clubs can make a big dent in your wallet, so make sure you are budgeting for them. We like to think that we’d never be that girl who drops her phone in the toilet, but it *just might* happen. In addition to your phone, at some point you’ll probably need to replace your computer, tablet, or TV. Whether you have to pay for Microsoft Office or some specialty software like Photoshop, make sure you budget for those large expenses. Whyyyyy do cars have to be so expensive?? The list of maintenance costs is exhaustive. Don’t forget to budget for tire replacement, brake replacement, oil changes, new windshield wipers, wheel alignments, mileage checkups, and the time that something is going to break and you know it’ll be expensive (happens to everyone!). Every year (or every other year depending upon your state and age of car) this bill comes up. A rare expense, but one that pops up for everyone. If I don’t get to work early enough, I have to park in a private parking lot which costs $10/day (oh, the joys of big city living). That adds up! Also, you have to pay for parking to get into some mall parking lots around here! Alcohol can easily blow up your budget. Find me one person who hasn’t been surprised by their Amazon Prime subscription renewing each year. Oh how I love Sirius XM. But they are another sneaky subscription cost that may surprise you and your budget. If your insurance, warranty, or credit card doesn’t cover the cost of AAA-type services, then make sure you budget for an AAA membership each year. There are two professional work societies that I am a part of. Unfortunately my work does not pay for them, so each year I fork over some money to remain a member. Make sure you have a budget category or a house-maintenance fund for all those surprises that come up when you’re a homeowner. Some are big expenses (like plumber-related problems) and some are smaller expenses (like air filters). This is a pretty cheap monthly expense so make sure you have renter’s insurance. It’s so unfair to be a girl sometimes. My husband can get a great haircut for $12+tip while my hair costs…a lot more than that. It can cost a lot to throw a party. Alcohol alone can cost an arm and a leg. The subway/metro and Uber/Lyft are so convenient – but certainly add up. If you have pets, you likely have a budget category for pet food. But what about doggie beds or doggie toys? If you go on vacation, a huge expense is putting your dog in a kennel (or paying someone to dog sit). Make sure you include this in your budget. Or maybe you put your doggie in doggie day care some days a week to tire the little guy/gal out. I’ve been part of two HOA – one that charged quarterly and one that charged yearly. Since they were not monthly expenses for me, they always seemed to surprise me and my budget. Just gotta put it in the budget so there are no surprises. It’s not cheap to see. There’s so much joy in receiving (and sending) hand written letters and cards. But stamps are expensive. Also, if you live far away from friends and family and find yourself mailing a lot of gifts and packages, make sure you budget for shipping costs. Make sure you include this expense if you hire someone to shovel your driveway or sidewalk. Making sure that you have a fully funded emergency fund is very important for your financial health. The emergency fund is there for you to use and if you do, you need to make sure that you replenish it ASAP…so don’t forget to make it a budget category if you need to. Alternatively, you could just add vitamins to your medications budget category. Cleaning the condenser coils yearly can really improve the efficiency of the A/C unit and reduce your energy costs. If you love your magazines, you should definitely check out an Amazon Prime membership – you get free access to a ton of magazines (and of course like a million other perks like 2-day shipping, access to a great selection of movies and TV shows, unlimited photo storage, music, books, etc.). Read more about Amazon Prime perks here. Get your budget & finances in order! Sign up to receive these 3 printables over the course of 3 days. Start fresh with a monthly budget, tracking your expenses with a spending log, and never forget a bill again with a bill checklist. Success! Check your email for your first printable. Everybody has gone over budget. It’s going to happen…even to those who are Type-A about their budgeting. But by using the list above of commonly forgotten budget items, you won’t be surprised by any expense again. If your expenses outweigh your income, and you can’t seem to get your budget to work, it may be time to start a bare bones budget. What budget category have you been forgetting to include? Did I miss anything on this list? My sister has to pay for her son’s college education because he was forced to use his parents income on his financial aid forms so that was an unexpected cost to her finances. So college loans could be a budget category along with unexpected school supplies like art supplies and expected expenses like textbooks. Lisa, these are great ideas! I’ll be adding your suggested categories when I update this post. Thanks!